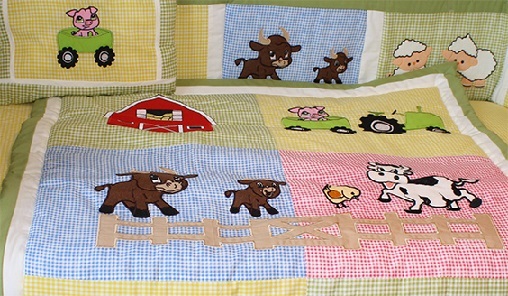 Sweet and cuddly farm animals are bedtime friends for your baby in this super cute farm themed crib bedding set. The set features a neutral colour palette of barn red, green yellow and a baby blue giving this a bright and fun appearance. A variety of animal appliqués and are beautifully embroidered and add texture and depth to this barnyard scene. This set provides a very stylish design for your nursery and is made from high quality 100% cotton. Fabrics are made of 100% cotton and are machine washable.